The Ohio solar industry is an emerging one, ranking 28th in the country in terms of number of megawatts installed, and it is indeed a great state for homeowners to consider powering their homes with solar energy. According to the Solar Industries Association, the Ohio solar market is projected to add 948 megawatts over the next five years, which ranks 18th among all states in the U.S. That’s pretty significant growth, and Ohio homeowners are being drawn to it. All this is happening while the costs to install solar have dropped by more than 70 percent since 2010, making solar energy an affordable option for many consumers. POWERHOME Solar has taken advantage of that growth to become the No. 12 residential solar contractor in the nation, per Solar Power World’s 2018 rankings. We know all about the benefits of going solar, and below we give potential Ohio solar customers the 10 biggest benefits of doing just that. 1. You save money. Your monthly payment for solar combined with your much lower power bill will be near or below what you’re already paying the utility company. Because your solar payment is fixed, you’re protecting yourself against the power company’s rising prices. That will save you money in the long run, and once you pay off your system entirely, your savings will rise significantly. 2. You save the planet. According to the SEIA, solar energy currently accounts for only 2 percent of all electricity in the U.S. As that number rises, so does our energy independence from non-renewable energy sources. Solar energy is clean and abundant. The panels on your rooftop or your ground-mounted array are quiet and will reduce your home’s carbon footprint. 3. You may be eligible for tax credits. Eligible taxpayers can receive a 30 percent federal tax credit on qualified expenses from systems installed through 2019. Individual states also may have their own credits, which could reduce the cost of your system further. Consult your tax professional to determine your eligibility for solar tax credits. 4. Lengthy warranties mean peace of mind. Your solar panels come with a 25-year warranty, and the inverter (the device that turns the direct current electricity that your panels produce into the alternating current electricity that your home uses) has a 12-year warranty with the potential to be extended 13 years beyond that. When warranties are that long, you know these items are built to last. Sit back and enjoy all the power your system produces! 5. Your home’s value figures to rise. Research by Lawrence Berkeley National Laboratory in 2015 found that “home buyers consistently have been willing to pay more for a property with PV (solar panels) across a variety of states, housing and PV markets, and home types.” That study looked exclusively at PV systems that were owned, and not leased. That’s important to note, as POWERHOME sells the systems it installs. 6. Ease of process from start to finish. POWERHOME Solar is one of the few American companies that uses American-made products and designs, permits, finances, sells, installs, maintains and monitors solar energy systems and panels for residential, commercial, utility, and government applications 100 percent in-house, to best manage quality assurance and customer satisfaction. If you ever encounter problems with your system, you know who to call. 7. There is no off switch on the sun. The sun has done its thing for over 4.6 billion years, and last we checked, it won’t be stopping anytime soon, either. While the summer months typically provide the most solar electricity generation, know that even in winter, solar energy is still produced. 8. Local jobs creator. The U.S. solar industry employs 250,000 people, and these jobs cannot be outsourced. One hundred percent of POWERHOME’s services are provided solely by company employees to help boost local economies. Those are all big benefits for the U.S. economy. 9. You’re powering your home with technology. What happens with technology? It only gets better with time. Solar panels are already long-lasting, but imagine how much better they will be in the future. Being at the forefront of this revolution helps put the U.S. on a faster track to energy independence. 10. Your solar panels are affordable. Chances are if you can afford your power bill, you can afford to go solar. 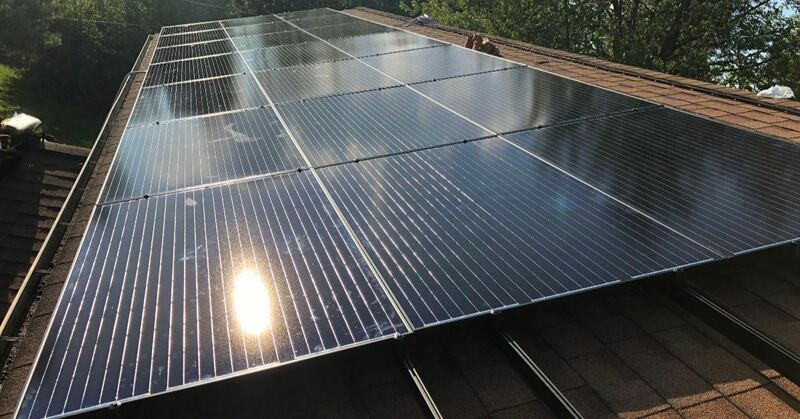 With our innovative solar program, Ohio homeowners can go solar for $0 up-front cost, save money on their electric bills, and generate their own clean energy.